Take a look at this dress. Anything strike you as being not-quite-right? Something which if done a little differently would make the design sing instead of hum quietly in the back row? Here's the back. Spotted anything yet? 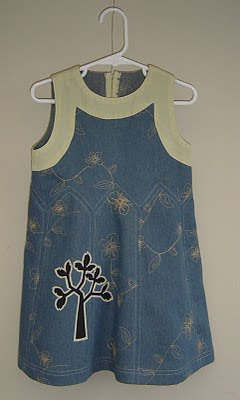 I made this dress for Isabella. The embroidered denim is so soft and I love the muted shade, but it refused to tell me what it wanted to be till I came up with this design. It WANTED to be this dress, but I think it was wrong. The seamlines which took me a very long time to sew did not pop as they were supposed to, and the topstitching didn't help. The big design feature of this dress is the zig zag seaming and it sort of gets lost in the embroidery, which is louder than the topstitching. So after thinking (stewing) about it for a while I came up with a solution. (No way was I unpicking all that topstitching and redoing it with two strands of thread or topstitching thread like I should have done in the beginning!) I went over it again. Or rather, I'm going over it again. It takes a very, very, very long time because it Must Be Right, which means that I have to wheel the sewing machine by hand to ensure that the needle exactly hits the existing holes. And you know what? Take a look at this photo. On the plus side, I'm really pleased with the colour combination of the denim and facing - it's a lovely soft yellowy green. Is this colour called celadon? Anyway, I love the two together, and I totally love the tree. Stenciled in black from the Duplo robot tree I photocopied. Done in black as directly inspired by the beauty on Foxs Lane here (although I also absolutely love this one too) Hers are screenprinted directly onto vintage sheets, and the crisp sharp black looks stunning against their slightly faded softness. 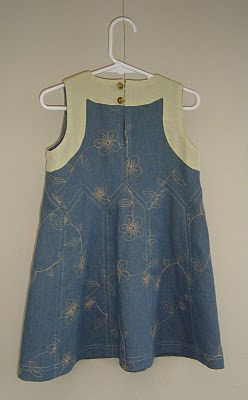 Mine was stenciled onto a scrap of the facing fabric then sewn on and trimmed. It's beautiful, and I did stare at it for a while trying to figure out what was "wrong". Then I thought, "Well, the topstitching doesn't REALLY pop." It think the second pass will take care of it. That zigzag line is beautiful and I am so impressed with your perfect corners. Nice sewing!! This is something I remember from being on yearbook in high school. When laying out photos and verbage you never wanted what is called "trapped white space". That is a blank space that is blocked in or surrounded so that the eye goes directly to the blank space instead of to the photos. I have always kept this trick in mind and when I look at your wonderful jumper I see that you have some trapped "white space". 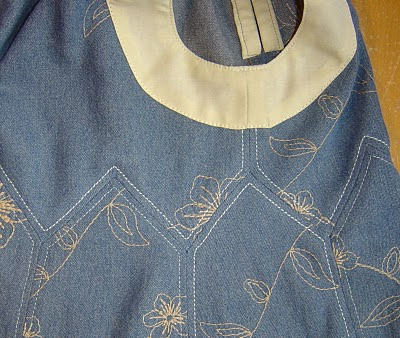 Look at the bodice area on the wearer's left. You will see some blank denim without tan embroidery. 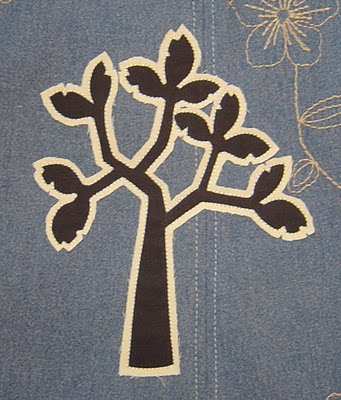 That empty spot competes strongly with the wonderful appliqued tree. The blank space is repeated to a smaller degree in the back. It lopsides the perception of the design just a tiny bit and may explain the unconscious wonkiness you are feeling. 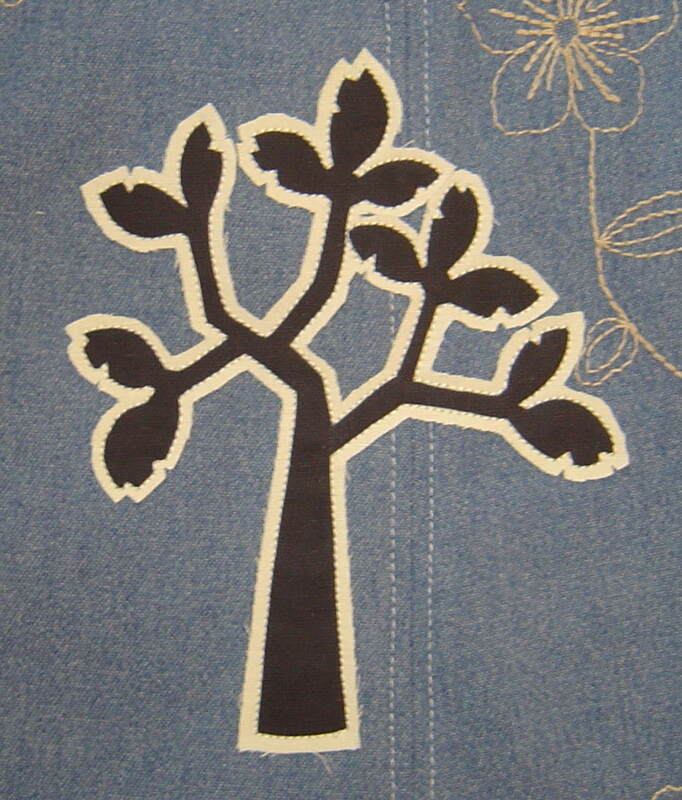 I know that you are working with a pre-embroidered denim print and are stuck with that spacing and it is very hard to work around it sometimes. But I hate to hear you bash your topstitching and your awesome sewing when I think it is just that the spacing of the embroidery is a little larger than that little bodice could handle. You did a terrific job. I wish my points looked as good. If this is a prototype why not try it in a more condensed print, one that won't "trap white space" in the small areas like bodices. I think you have winner here. Love that little dress, and no, I don't see any topstitching problems. Good grief that's a fancy dress. I'd be impressed with myself if I managed to get one section sewn together... oh wait, we're talking about Miss Perfect Pants. LOL It's very cute and I think you can bump it up with another pass too. (I'm not sure how I missed this post earlier, I think Google is a weirded out lately).